In 1981 hospital wards in the United States and elsewhere began filling with patients who had unusual infections that developed because their immune systems had become very weak. Their underlying disease soon had a name—acquired immunodeficiency syndrome (AIDS)—and within a few years scientists discovered the virus that caused it, HIV-1. But until the mid-1990s an AIDS diagnosis was a death sentence. Then, David Ho (1952 - ) and colleagues at the Rockefeller-affiliated Aaron Diamond AIDS Research Center discovered that treating patients with a combination of three or more antiretroviral drugs could keep the virus in check. The initial clinical trials of this therapy were carried out with patients at the Rockefeller Hospital. Today, in the developed world, AIDS is a manageable chronic disease thanks to the "AIDS cocktail" of combination antiretroviral therapy. Ho arrived at this approach to AIDS therapy after studying what the virus does in the body of an infected person. Fastidious quantitative studies with patients at the Rockefeller University Hospital revealed that HIV-1 replicates continuously at an astonishingly fast pace. Over time, the immune system becomes depleted and cannot protect people infected with HIV-1 from everyday pathogens in the environment that don't usually lead to problems. These studies of viral dynamics changed the conceptual paradigm for understanding HIV-1 infection and led to the new therapeutic strategies. They also found that HIV-1 does a sloppy job of copying its genetic material as it reproduces. Within the body of a single infected person, many different mutated versions of the virus exist. HIV-1 can change quickly, and so it quickly evolves resistance when an infected person takes a single drug. But Ho and coworkers found a way to corner the virus: by giving patients three or four drugs at a time, HIV-1 could not mutate rapidly enough to evade all of them. By 1996 they had succeeded in reducing HIV-1 levels to the point of being undetectable in a group of patients treated with the new therapy. 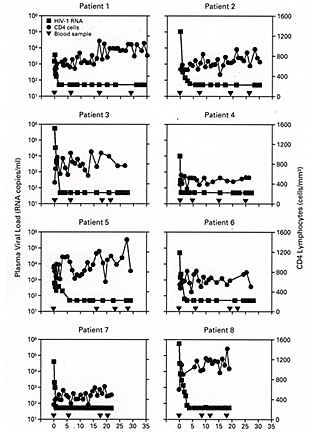 Today some 25 drugs targeting different steps in the HIV-1 replication cycle are available. Yet antiretroviral medications control HIV-1 infection rather than eradicate it, and are not accessible to the vast majority of the 33 million people worldwide who are infected. Since 2001 Ho has turned to the development of novel AIDS vaccines, with work both in the laboratory and with human subjects that are ongoing at Rockefeller University Hospital and abroad. He heads a consortium of scientists in this pursuit, supported by the Bill and Melinda Gates Foundation Collaboration for AIDS Vaccine Discovery. Ho's research group also is investigating the use of monoclonal antibodies to prevent and treat HIV-1 infection. David D. Ho received his undergraduate degree from the California Institute of Technology (1974) and his MD from Harvard Medical School (1978). He completed his residency in internal medicine at the University of California, Los Angeles (UCLA), School of Medicine (1982), and then completed a fellowship in infectious diseases at Massachusetts General Hospital and Harvard Medical School (1985). He has held academic appointments at Harvard Medical School, the UCLA School of Medicine and the New York University School of Medicine. 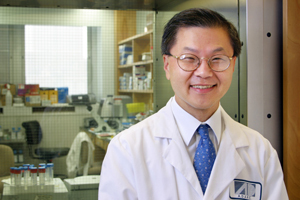 Ho has been scientific director and chief executive officer of the Aaron Diamond AIDS Research Center since 1990 and was named professor and physician at Rockefeller in 1996. He is the Irene Diamond Professor at Rockefeller. Among many honors, Ho has received the Edward Ahrens Award in Clinical Investigation and the Friendship Award from the State Council of the People's Republic of China in 2003 and was awarded the Presidential Citizens Medal in 2001. He received the Hoechst Marion Roussel Award (now the Aventis Award) in 1999, the Squibb Award from the Infectious Diseases Society of America in 1996, the New York City Mayor's Award for Excellence in Science and Technology in 1993 and the Ernst Jung Prize for Medicine in 1991. He was a scientific honoree of the New York Academy of Medicine in 1998 and Time magazine's Man of the Year in 1996. He is also the recipient of 12 honorary doctorates. Ho is a member of the American Academy of Arts and Sciences, the Institute of Medicine of the U.S. National Academy of Sciences, and the Academia Sinica, as well as a foreign member of the Chinese Academy of Engineering.